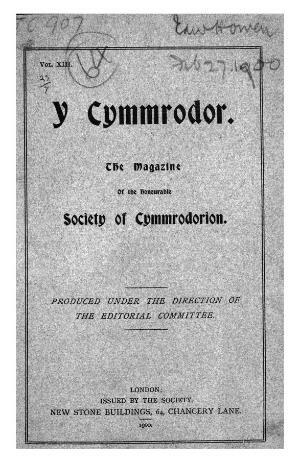 The series of Y Cymmrodor was re-started in 1877 (Vol. I), containing historical and literary essays; in 1939 (Vol. XLVI) it changed to become a series of single-volume transcripts of major Welsh historical sources, ending in 1951 (Vol. L). The publication also includes society notes. For digitisation, the publication has been split into two sequences, Vol. 1 (1877) – Vol. 12 (1897) and Vol. 13 (1900)-Vol. 50 (1951). Publisher Details: The Honourable Society of Cymmrodorion was formed in 1751 by a group of Welsh people living in London, and was reconstituted in 1820 and 1873 to promote the arts education and culture of Wales. It published its transactions, lectures and reviews in two series: Y Cymmrodor and Transactions of the Honourable Society of Cymmrodorion. The journals were published on behalf of the Society by several companies in London and elsewhere. The Society also published a Record Series and single volumes.